Weekend Assignment: #278: How often do you blog? 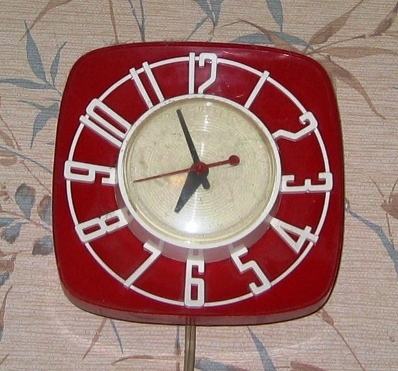 Do you try to maintain a schedule, or just blog when you're inspired and have the time? How do memes affect your blogging habits? Extra Credit: Are you blogging more or less often now than you were a year ago? If you've been reading this blog for a while, you know that my blogging schedule has gone all to heck in recent months. For years I blogged every single day, no matter what. There were at least two occasions when I pulled all-nighters at hotels with bad internet connections, trying desperately to connect long enough to get a blog entry posted. Okay, so I might have gone 30 hours between entries one day, 18 hours the next, but the rule was, I always posted before going to bed. Or if I had connection problems or was just too sleepy, I would take a nap for a couple of hours, and then get up and get the entry done. But several months ago, between Facebook, CPA review assignments and a suspicion that obsessive daily blogging was not necessary a good thing, I gave myself permission to miss a day. And then another day. Soon I was only blogging three or four times a week! It eased my immediate time pressures, but it didn't make it any easier to blog effectively, to come up with good pictures to post and interesting things to say. And I feel that I've lost a measure of self discipline and good writing practice, without gaining anything substantive in return. I have never, ever missed a Monday Photo Shoot or a Weekend Assignment, not since John Scalzi started the former and I first discovered the latter, both in his now-defunct AOL journal By the Way. It used to be that I always posted my entries on Monday and Thursday nights, respectively, without fail. Now it may take me several days (in one case almost a week) to get to the Ellipsis Monday Photo Shoot. And even as the current host of the Weekend Assignment, I've often let Thursday night become Friday night. Having written over 250 WA entries as participant or originator, I now find it a little harder each week to come up with a new topic that might entice you to write something. It's much easier to keep up with the Round Robin Photo Challenges, because they're only biweekly, and we have a pool of suggested topics that we periodically manage to refresh. I'm sorry to say that despite my frequent dog-blogging, I haven't managed to participate weekly in Feline and Furball Friday, which Steven may be passing the baton on soon as his elderly cat Pickle is reaching the end of his life. 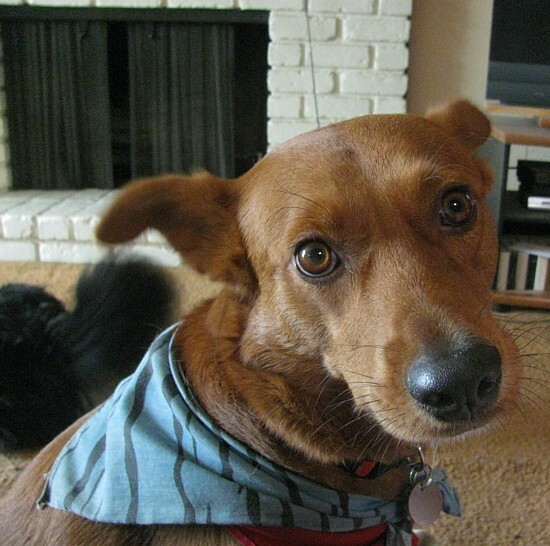 My heart goes out to him; the death of a beloved pet is never easy, even when it means the end of months of worry about your furry friend's prognosis and quality of life. We went through this with Tuffy Toro, exactly a year ago on August 1st. This blog is not just about the memes, though, nor will it ever be. 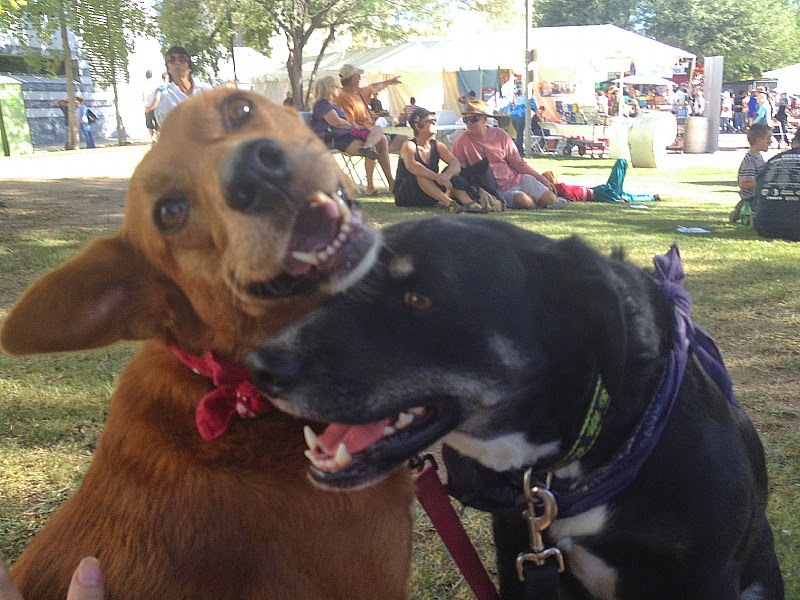 I still appreciate the opportunity to write a nice cathartic rant, or tell an amusing anecdote, or show off my dogs. I may not be adding to it daily at the moment, but don't expect the Outpost to be deserted any time soon. 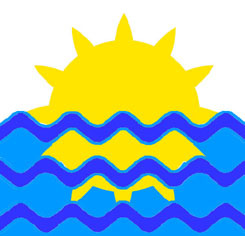 Most of my dealings with the city and county have been via their web sites, which, amazingly, work fairly well. I can pay my water bill, renew my car registration (except I forgot, so I'll be standing in line later this week), get hold of city and county departments, and so on. It's not perfect, but it beats sitting on hold. Now corporate entities are another issue. This year was a little different. We tried to file our state return electronically ourselves but we needed a PIN number for some reason. Since we have someone else do our taxes usually, we had no PIN. And since I was being the typical me and waiting until the second-to-last day, when I tried to call the number I got the, "We are experiencing and unusually high call rate. Please try again later." Yeah, right. I ended up mailing it in. Your turn! And please, if you have an idea for a future Weekend Assignment, email me at mavarin2 (at) gmail.com. Thanks! As I mentioned in my previous entry, Pepper was groomed this week. 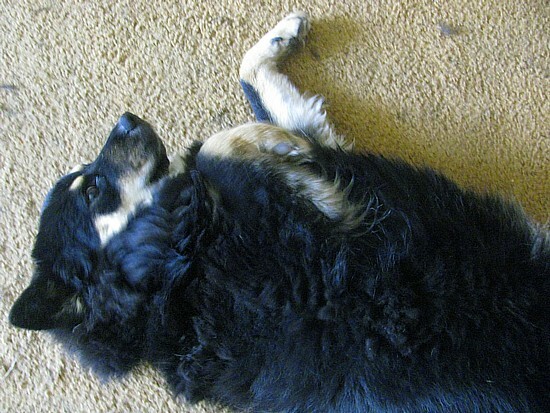 She had been shedding clumps of black fur all over the place; more important, all that fur can't have been comfortable for her in all this 100-degree-plus heat. So I took her to PetSmart on Tuesday for the "Furminator" treatment. Most of her undercoat is gone, her coat is soft and shiny, and she has hardly been shedding at all. 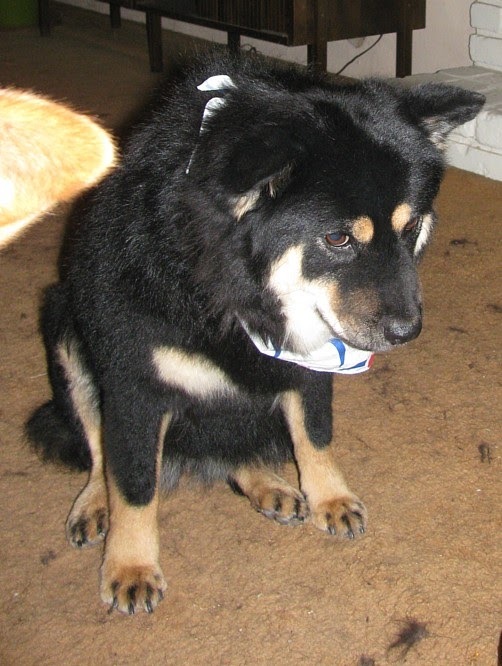 She also acquired a bandanna that actually looked semi-decent, before shedding it in the back yard. 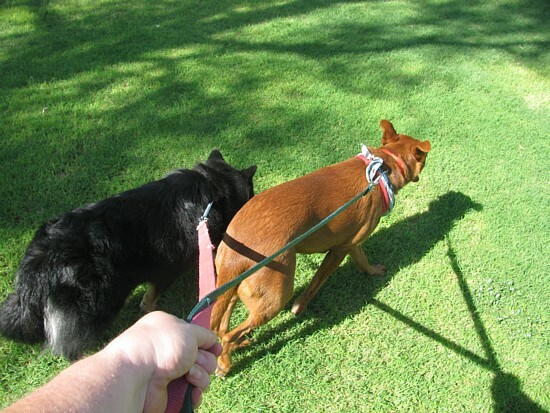 It was suggested to me the other day that the problem of taking the dogs out in the Arizona heat might be solved by taking them out early in the morning. I try never to be conscious that time of day, if I can help it; but nevertheless I tried it on Thursday morning. By 8 AM(?) we were at Miko's Corner. Even at that time, things were heating up. Most of the humans were congregated at the picnic tables under the ramada roof. Even the dogs tended to be in the shade, and did very little running around. All in all, it was no improvement. 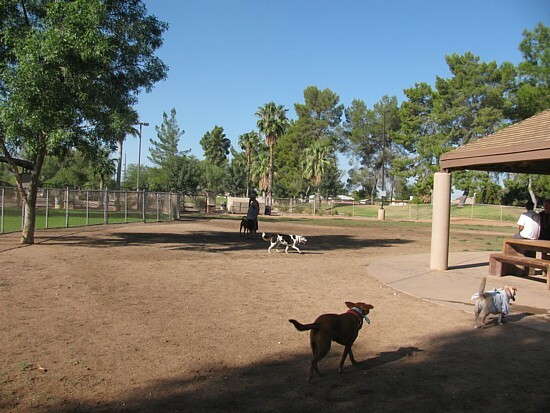 There was a definite advantage, though, when we left the dog park itself for the wider romping grounds of Reid Park. The dogs and I finally got to see the critters that have dug so many holes in the ground outside the rose garden. 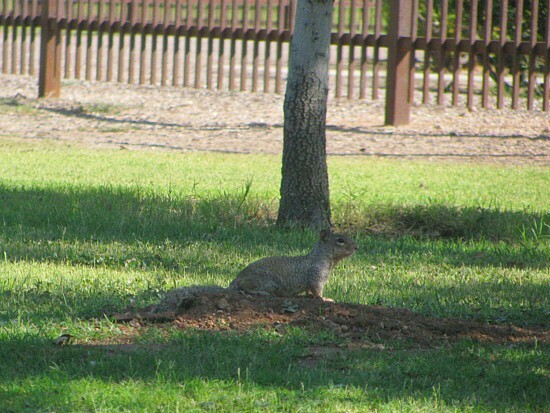 I had thoughts of gophers, or possibly something even more exotic, but the truth was more prosaic. 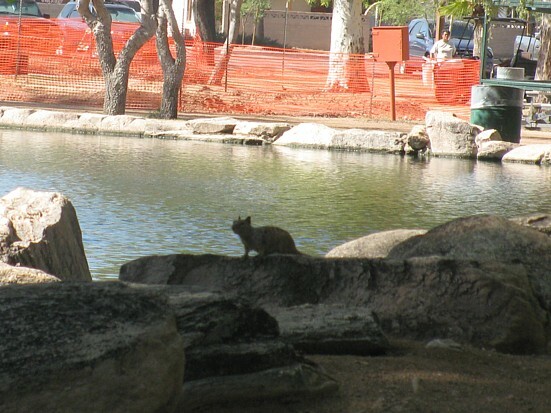 The morning shift at Reid Park featured lots and lots of rock squirrels, the Arizona equivalent of the common gray squirrel. 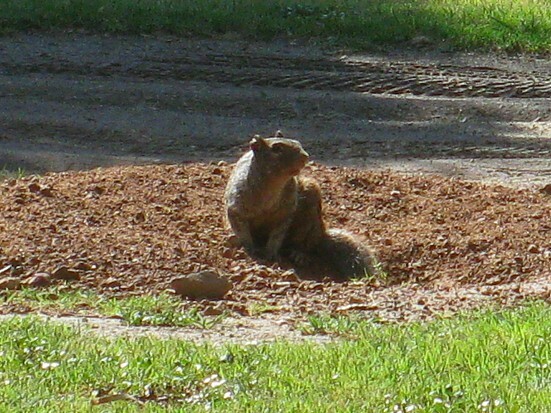 They were popping in and out of holes, some of them freshly dug, peeping and peering warily at the dogs. And the dogs were peering right back, making noises of their own! I have never felt them tug on the leashes quite this hard. But no, I didn't let go! One year as a Blocher dog. When Carly assigned "Landmarks" as the topic for this week's Ellipsis Monday Photo Shoot, I was briefly stumped. 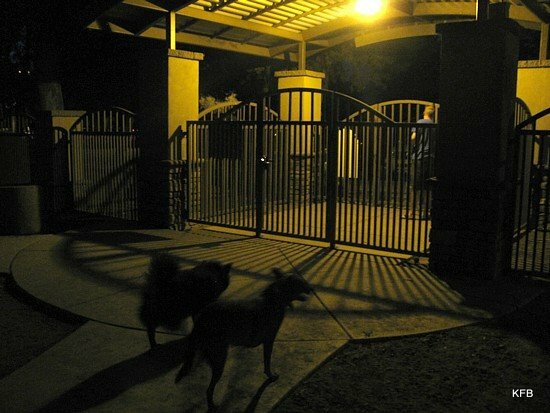 Over the years, this blog has featured lots of photos of Tucson landmarks already: historic buildings, ballparks, Tucson's one downtown skyscraper, interesting bridges, public statues and so on. What was left that I hadn't already photographed for you? 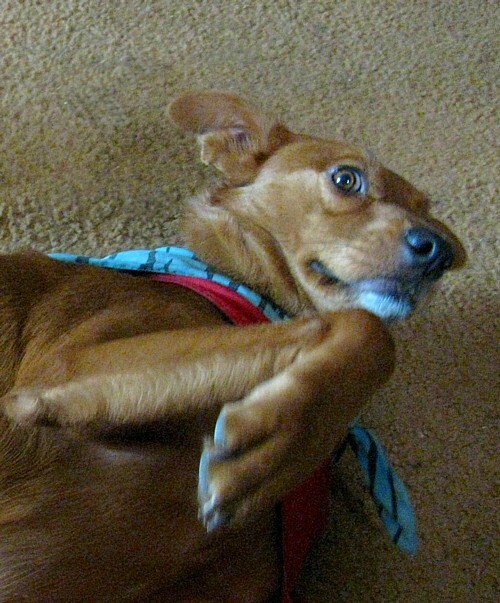 And, could I get to it on a day when I was scheduled to give blood and Pepper had a grooming appointment? 5151 East Broadway is the tallest building for miles around. 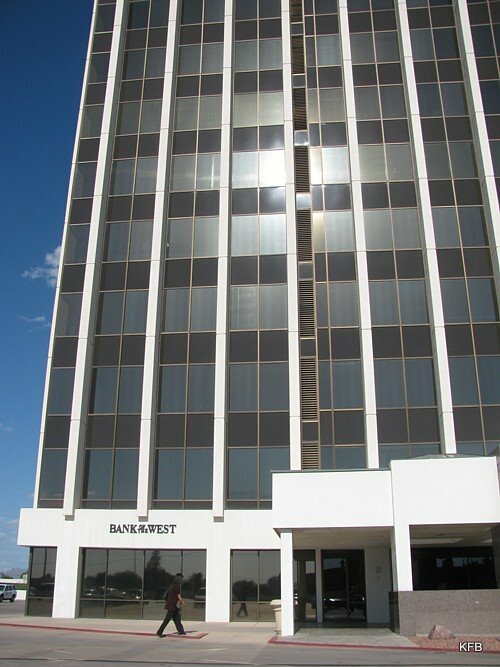 This is the office building at 5151 East Broadway Blvd. As far as I can tell, the street address is the complex's only name. It stands at the corner of Broadway and Rosemont, across the street from Barnes and Noble and very close to a travel agency I worked for in the late 1980s. 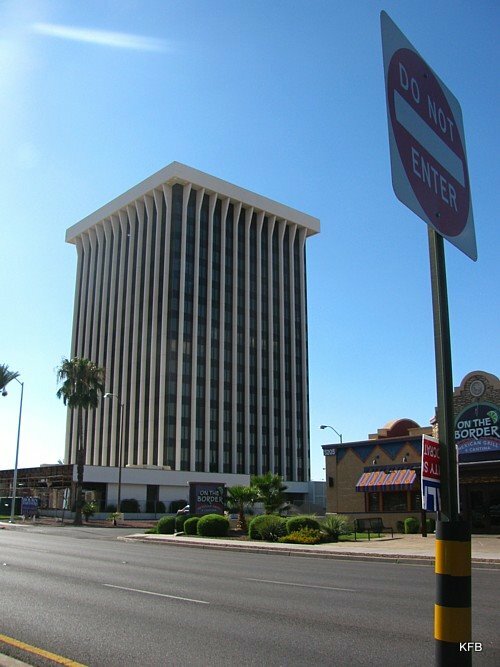 Built in 1975, it is the fourth tallest building in Tucson, and can be seen from miles away. 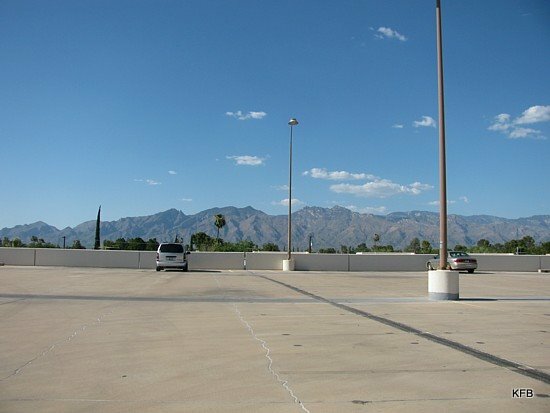 Tucson doesn't go in for skyscrapers much, partly I suspect because nobody wants to block the mountain views we have in every direction. 5151 is the exception. According to a really neat page on Google 3D Warehouse, it has 16 floors and is about 246 feet high. My late mom's friend and therapist has an office there, as does one of my recruiters. In front of the tower on the Broadway side of the property is a long, flat annex, which has recently been gutted. I don't know why this is, whether there was a fire or a need to remove asbestos, or they just want to redo it for some reason. 5151 makes the Rincon Mountains look short by comparison. Parking for 5151 is on a large, slightly sloped deck behind the tower, accessed primarily from Rosemont. This flat expanse makes the tower stand out more than it does from Broadway itself. And check out the view from the back of the parking lot! It's kind of hard to get a sense of the size of the building. If you're back far enough to photograph the top of it, chances are good that the view of the bottom is obstructed. 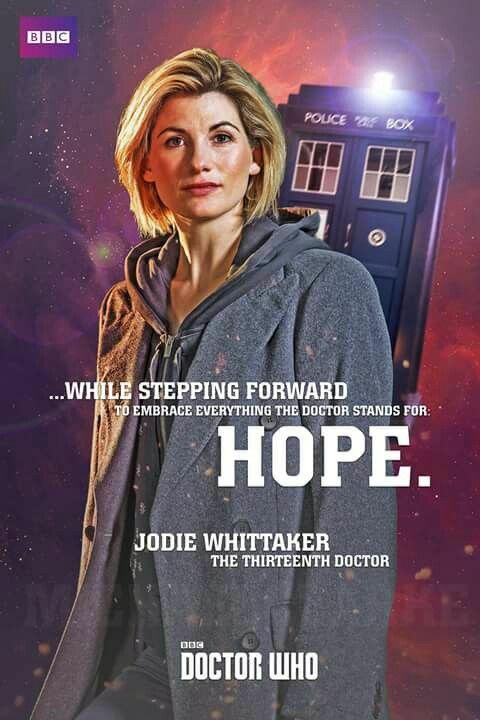 Also, the fact that it's broad rather than narrow mitigates the impression of height. But trust me; it's not a small building. And by the way, I appreciate its modern style. A little over two miles west of 5151 is a very different tower, from a very different period in Tucson's architectural history. This is the El Conquistador water tower. Built in 1928, when Country Club Road was at the edge of the city rather than in the middle of it, the tower is all that remains of the ambitious but doomed El Conquistador Hotel. 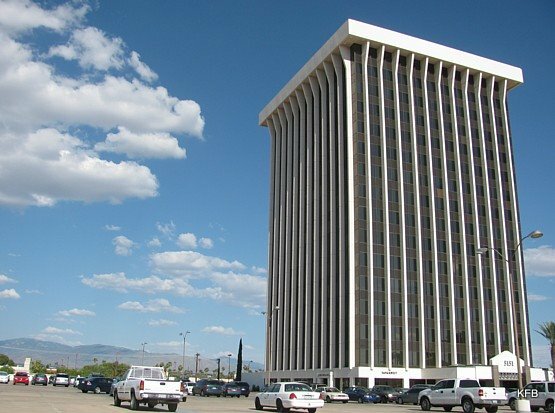 According to the book Tucson: The Life and Times of an American City by C. L. Sonnichsen, the project ran out of money before the hotel was completed. Even after it was finished it continued to lose money, having too few rooms to offset the cost of its opulence. The El Conquistador underwent bankruptcy reorganization in 1935, changed hands a few times, and lost its appeal as the city grew up around it, particularly the El Con shopping center, which opened across Broadway from it in 1959. 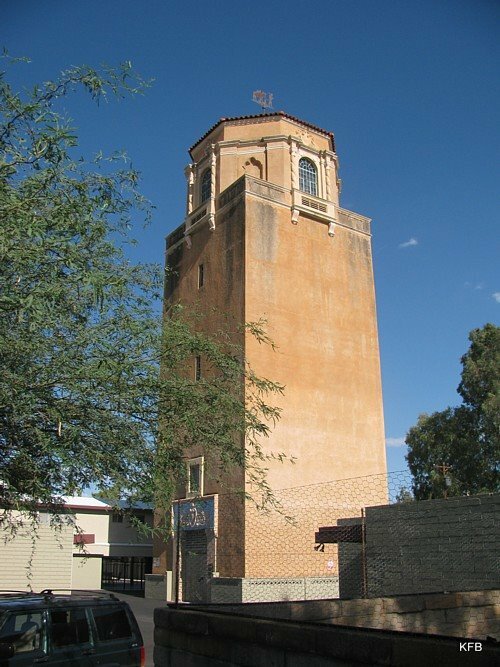 The hotel was razed in 1968 - all except for the water tower, which is on the National Register of Historic Places, and is designated as an official Tucson Landmark. These days it's tucked away about a block behind Broadway, between an urgent care facility and an unmarked condo or apartment building, a few blocks north of Hi Corbett Field. 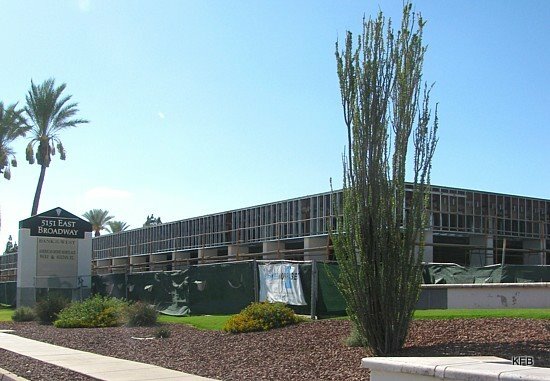 Several other features from the hotel have been moved to other locations around Tucson, including a copper dome that adorns the Casa Blanca shopping center on North Oracle. 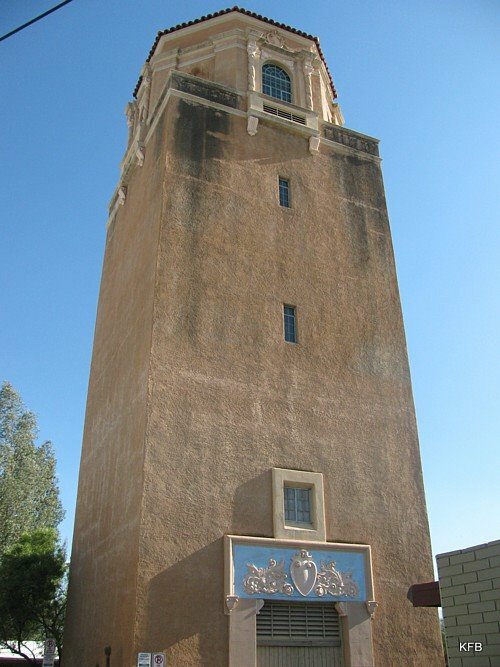 The "Spanish Colonial Revival" or "Arizona Mission" style was added to the tower in 1932 under the direction of Tucson architect Roy Place, who was also responsible for the Hotel Congress and a number of other historic Tucson buildings. 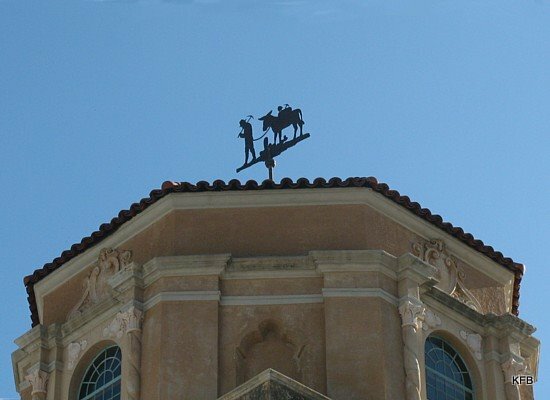 My favorite detail on the water tower itself is this weather vane, depicting a miner and his donkey. Be sure to check Carly's blog Ellipsis each week for the Ellipsis Monday Photo Shoot. I'll have an entry sometime tomorrow morning for Steven's Feline and Furball Friday, followed a little later in the day by the new Weekend Assignment - assuming I can think of a new topic by then! Any last-minute suggestions? Back in the days of his AOL blog By the Way, John Scalzi used to periodically warn his readers and fellow bloggers not to post pictures of other people's children without permission, because of the privacy and security issues this might pose. I have not always complied perfectly with this principle, but I try to be sensitive to it, and not to cross a line. So when I drove past the Alamo Wash early yesterday evening and saw a child doing something rather amazing, I did not stop the car, turn around and try to get a picture. But I will tell you about it. The photo above is from back in May, right after a rain storm. 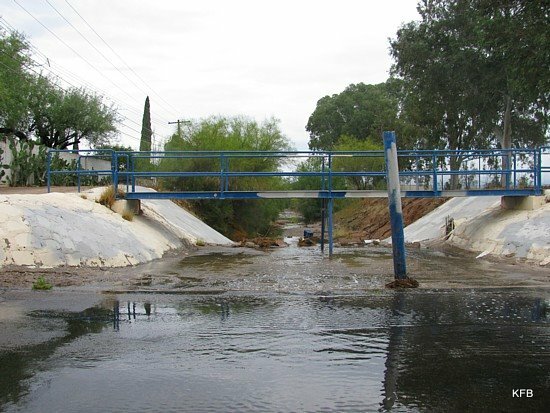 Where you see water flowing in the picture, substitute a dry street and dry dirt, and you'll have some idea of the scene Tuesday evening. As I approached the wash on my way home, with newly-groomed Pepper and rather relieved Cayenne, I noticed there were a couple of kids playing under the blue bridge. It wasn't until I drove past them that I saw what they were doing. The boy, maybe ten years old, was wearing a Spider-Man costume, a decent one but with a crummy mask. He was hugging the slab of concrete in the left (west) side of the wash, trying to crawl up the wall! His sister(? ), a few years older, was dangling a rope from above, presumably trying to help. I tried to give her a high sign, but I doubt that she understood the message. Already past the wash and the kids, I shouted out the open window, "I LOVE that!" and drove away. I've taken my photos for the Ellipsis Monday Photo Shoot and will edit and post them after I've slept. They do not involve Spider-Man or the wash, but please stop back anyway. Round Robin: "But It's a Good Car"
This week's Round Robin Photo Challenge, My Vehicle Of Choice, was suggested by Suzanne of Suzyq421's Photo Blog. I'm not going to write much about fantasy vehicles I'd like to own. Frankly, my appreciation of cars hasn't advanced all that far from when I was 6 years old. Back then I believed that there were two kinds of cars, Ford and Rambler. These days, I could wish for something newer and more environmentally benign, but have only a vague idea what that might be (a Prius? a Tesla?). Surely whatever vehicle we actually drive, unless it was a gift(! ), is the vehicle we chose. 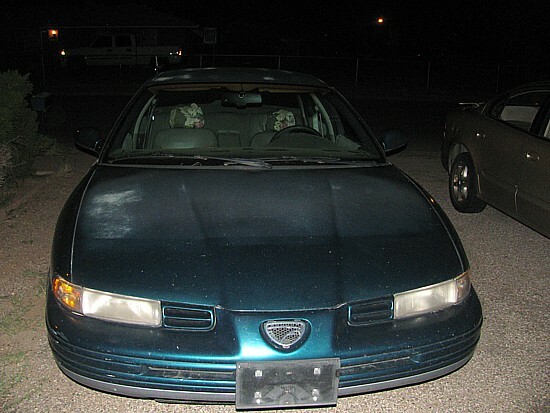 Here's mine: a 1994 Eagle Vision Tsi. I got it several years ago, after a kid in a 1965 Ford truck totaled my 1997 Saturn. Before I bought this car, I knew the make "Eagle" only as a word in the advertising phrase, "See your Jeep Eagle dealer." Yet this is what I chose to buy, because it was the best car my Saturn dealer had on the lot for the money I had to spend, which was less than the replacement cost of a 1997 Saturn. Besides, it was pretty. Having been in the punishing climates of Arizona and before that, Florida (according to Car Fax) for all these years, my poor old Eagle has lots of mostly cosmetic imperfections these days. The finish is going on the teal-colored exterior, to the point where there's little or no paint left in spots. 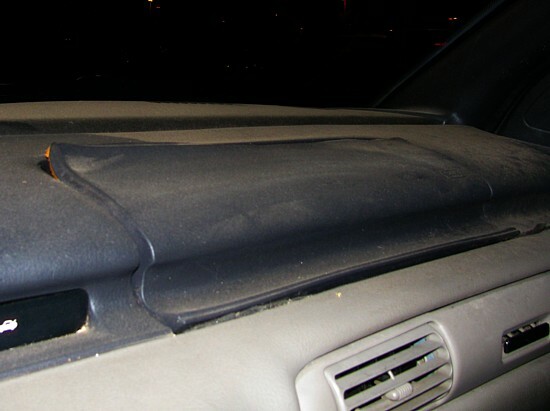 Inside, the panel covering the air bags is sun-warped, and I admit I've let the Arizona dust take over a bit. I can't even get out of the car without rolling down the driver's side window, which is itself barely functional. 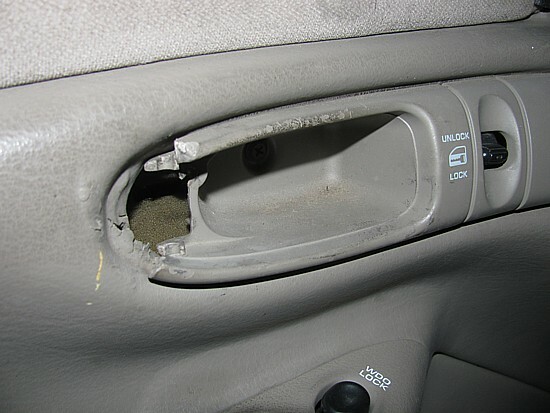 The interior door handle broke off months ago, and the window goes up all the way only if you push against the glass with one hand while operating the window's motor with the other. 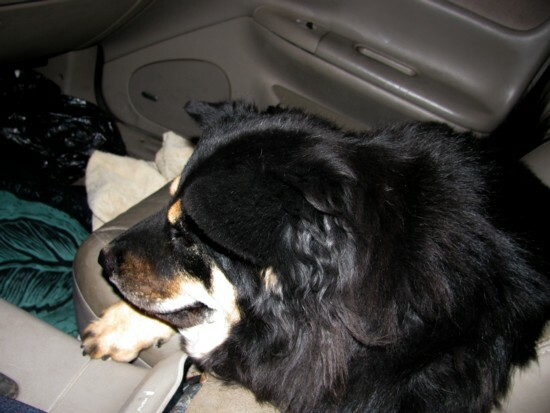 ...one of which likes to ride shotgun. One advantage of not having a pristine car is I don't worry about the dogs messing it up, scrabbling and scratching and licking and jumping around. It's already a mess. And two: it has the most entertaining, most useful silly accessory for a car in Arizona: a temperature gauge. I don't swear that it's completely accurate, or know precisely where it takes its readings from. But I take a perverse glee in being able to report that it's 109 degrees at midafternoon, or 92 degrees at 8 PM, well after dusk. 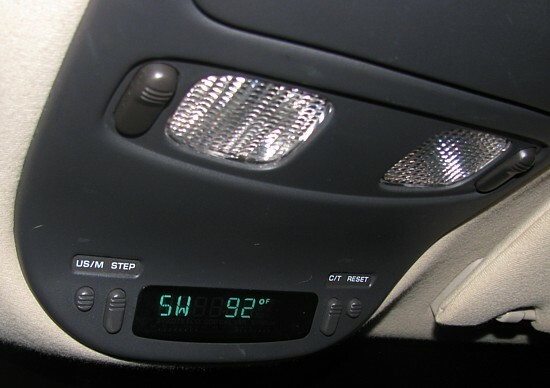 Okay, so the car stereo no longer works, but at least I get to gripe about the heat! When I was in college the first time, my first car was a 1967 Dodge Coronet wagon, a hand-me-down from my mom. I loved the thing, but my friend Howard used to tease me about it, repeating back my own defensive words, "But it's a good car!" Eventually the Syracuse winters took their toll, and the hinges holding the hood of the Dodge rusted into dust, sending the hood sailing over my head one day at 55 mph. That was pretty much the end of that car. The Eagle, so far, has no problems sufficient to end its usefulness. May that be true for a while yet! Lin **Welcome New Member** - Posted! And a little programming note, because I'm woefully behind: please see the entry below this one for the Weekend Assignment, and watch for my Ellipsis Monday Photo Shoot entry later today. See you then! Weekend Assignment: #277: We've all become used to automated phone routers ("To continue in English, press 1"), long waits at government offices and other bureaucratic obstacles to getting something done. Have you any particular horror stories along these lines, or have you had mostly good experiences with government agencies? Extra Credit: Does this problem seem to be getting better or worse? As I've mentioned before, I haven't received an unemployment insurance payment since the end of May, despite filing weekly claims every week since. When I discovered this in late June, my online research and a notice from the state led me to file a claim for an additional seven weeks of emergency federal unemployment. The week after I did that, I learned that this was not the correct thing to do. Perhaps because I first filed my original claim at the end of May, 2008, after losing my job at Beaudry RV, my benefit year ended at the end of May 2009. Any benefits earned by me through working from June 2007 to May 2008 ended with that fiscal year. To get any new benefits, I needed to have earned them by working between June 2008 and May 2009. So far, so confusing, right? But the good news is that I worked solidly for a good wage between June and early September, 2008, and for a few days in January 2009. And guess what? That's enough to qualify! So I supposedly filed this new claim over the phone in early July with someone from the state unemployment insurance office, who had actually called me about my case. But for whatever reason, nothing we talked about that day got into my electronic file. My new claim never went into effect. Okay, then the logical thing to do was to file a new claim myself, right? Only I couldn't, or so it seemed. Every time I tried to file the claim online, I got through every screen of the online form, only to be told on the last page that a system error occurred. This happened over and over, on different days, using Firefox, IE and even John's Mac (also with Firefox). Nothing made any difference. The error screen at the end helpfully directled me to call and file by phone, advice which was reiterated by the notice I got in the mail about my 7-week claim being denied because of the benefit year ending. "Thank you for calling the [blah-blah-blah]. We are experiencing a high volume of calls and cannot take your call at this time." The recording goes on to say that you should file online instead. I got this same recording in many attempts to call over the last two weeks. Someone at the local DES (Department of Economic Security) office suggested that I write a letter to straighten things out. I did so last week, and they helpfully faxed it to the right place. Result: a further hold was placed on my file, pending resolution. "You're going to have to talk to them in person - on the phone, I mean," a DES employee told me yesterday. I explained that I hadn't been able to get through on the phone. That's when she suggested that I come in at 8 AM Friday morning and use their direct line phone, hanging up and letting it redial as many times as it took to get through. She told me that the first word I would hear on a successful call would be "Welcome," and to hang up as soon as I got anything else. When I did get through, the number to press would be 4. I would then be on hold for perhaps 20 minutes, maybe longer, but would need to keep holding. Hey, I had no intention of hanging up if I ever got through! Now, let me tell you about my morning today. I walked into the DES office at about 8:01 AM, but the DES employee from the previous afternoon, who said she would be there and willing to help me get set up on the phone, was nowhere to be seen. I found the directly line phone myself, sat down and started dialing. About 50 minutes later at 8:54 AM, after dozens of "Thank you..." messages, busy signals and "If you'd like to make a call, please hang up and dial again" recordings, I finally heard the welcome word, "Welcome....." At 10:20 AM, after a further hour and six minutes of jazzy hold music, friendly recorded apologies for the delay and notices that the 7-week extension could not be filed by phone, I got through to a person! And she was wonderful. She read and understood what was in my file, asked all the right questions, and researched my 2008-2009 work history, determining that I was indeed eligible for a new benefit claim, at the same compensation level as my previous claim. I had been worried that the new claim would be effective today or even later, but no, she set the start date at the end of May 2009. All those weeks in between that I filed for without immediate success will now be paid, less my gross wages from St. Michael's. As you can imagine, this is all a big relief. John had been talking about all the cutbacks we would have to make if this didn't go through, assuming I didn't get a job soon. John has no great hopes about the job market right now, but at least my safety net is back in place for the next five months. I can find a job by then - can't I? Well, we'll see. Meanwhile, I expressed my gratitude to Deputy 771, verbally presenting her with "imaginary flowers and virtual cookies." "Thank you, they're lovely!" she said. 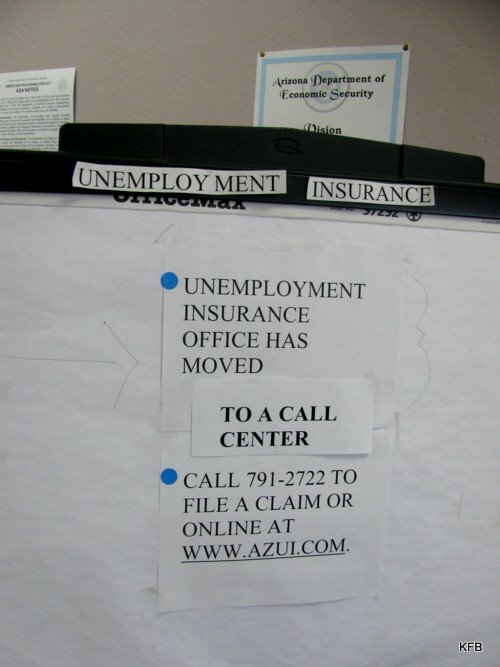 I'm not telling you all this as criticism of the Arizona Unemployment Insurance department or its personnel, or DES folks, or even the AZ UI web site. The glitch in my online claim was frustrating, sure, and perhaps needs tweaking. It could be that it was programmed to not go through if the file is set on hold, pending a telephone contact. If so, it would be nice if the web site could be scripted to say so. Nor am I criticizing the ARRA phone system (I swear to you, though, one of those Rs stands for Rapid!). The truth is that the state is swamped with claims in the current economy. They need and are hiring more people to work the phones, and I have no doubt that the telephone infrastucture itself isn't up to the workload. Nevertheless, the fact remains that the whole system is a big, confusing, frustrating mess! Are things getting better? Well, I have hope that the UI situation will improve with the economy and with the influx of new staff, and things certainly got better today for me personally. Meanwhile, I can point to a different state department where things are already much, much better than they were. 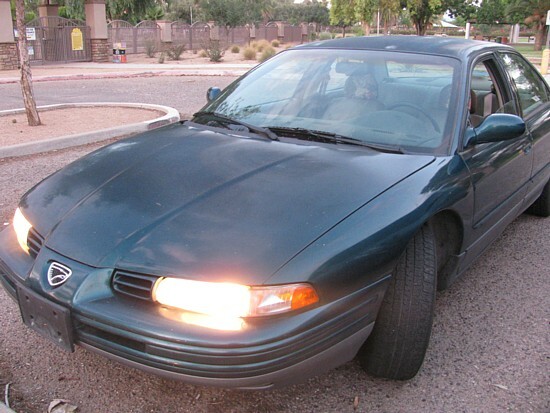 For a number of years now, the Motor Vehicle Department has had a website called Service Arizona. Using it means you almost never have to make a trip to MVD to renew vehicle registration, replace a missing one, or even order a vanity plate. It's fast, it's clearly and simply laid out, and it works great. As someone who in the old days sometimes sat in the MVD office for two hours on a workday, it's a huge, huge improvement. I actually use a pseudonym regularly, although technically it's not a pseudonym. I always give my name as Elizabeth (my middle name) at Starbucks, because spelling out Florinda gets really old. (Actually, it's spelled like it sounds and it sounds like it's spelled, but still, people have always had trouble with it...maybe that's more because it's unusual than because it's a difficult name, but I've never known for sure.) I've used screen names in a few online forums in the past, but during the last few years, I've almost always been online under my real name. I never intended to blog under a pseudonym, because if I ever want it to lead to anything, it all has to come together as part of the body of my written work. That's it! I hope this week's Assignment is more to your liking. Florinda will be out of town, so I'm counting on YOU to participate, okay? Thanks! For the Ellipsis Monday Photo Shoot #47: Patterns, Carly is encouraging us to look beyond the obvious in photographically parsing the concept of patterns. Hey, I can do that! But it's taken me all week to get past the first two sentences of this entry. Sorry about that - I've been distracted with my unemployment claim situation, church stuff and 1960s episodes of Doctor Who. Onward! I've got visual patterns for you, and also metaphorical ones. 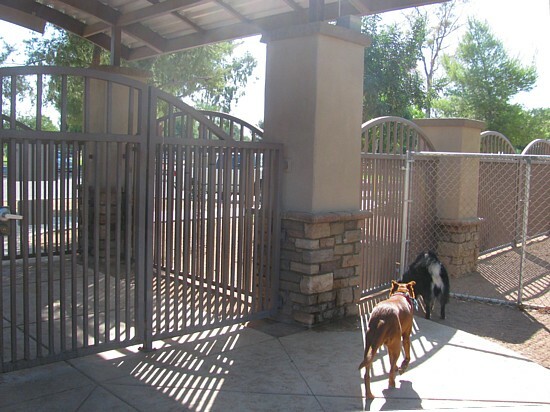 During this summer's hot and humid but fairly rain-deprived Arizona monsoon, a pattern has emerged in my outings with the dogs. 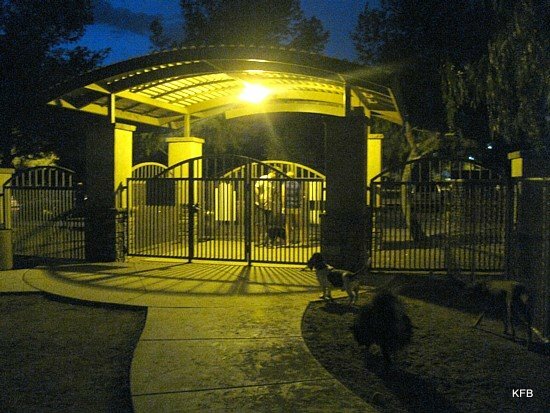 It used to be that we went to Miko's Corner Playground at Reid Park every single day around 5 PM - and then around 6 PM, and then around 7 PM when Rachel Maddow's show was over on MSNBC. But lately we've been going at or just after sunset, around 7:30 PM, when we go at all. On the other days, at about that same time, I take them up and down the block and probably down the alleyway, depending on the weather, and whether I think it will be full dark before we cover the half mile of alley. 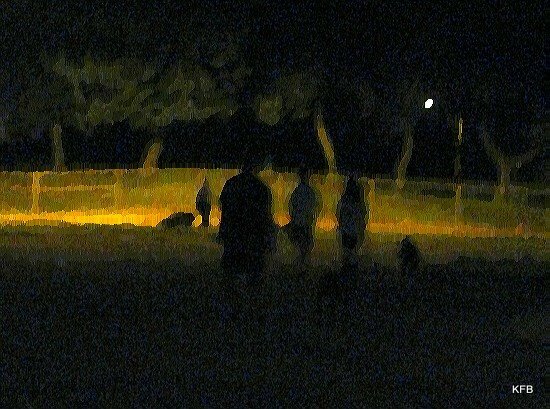 Lots of dogs and their owners are in the park after dark. This isn't just because I want to watch Keith and Rachel before going, and feed John, who comes home starving from work. It's mostly about the weather. Even a short stroll in hundred degree heat (or worse) isn't pleasant for me. More important, it can't be comfortable or even safe for Pepper with her long black fur, suitable for insulation as she herds reindeer through the snow as her ancestors did. So we wait until dusk, when the temperature falls into the nineties or even eighties. 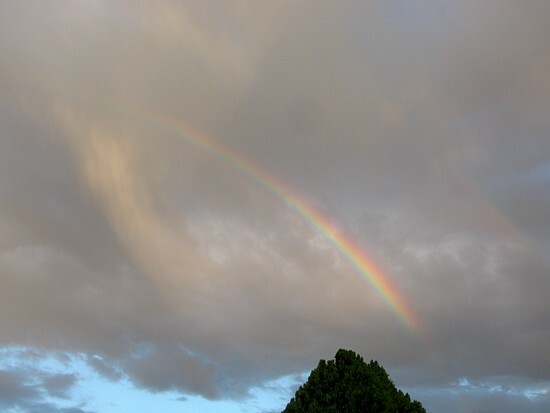 A belated rainbow - a pattern of colors! If we're lucky, the wind picks up as a storm comes in, because that's part of the pattern of the monsoon. The sky tends to cloud up in the late afternoon, and the rain, if it comes, gets here in the early evening. If it actually rains when it's time to walk the dogs, they miss out completely. But that hasn't happened nearly enough. We're just not getting the rain this year. 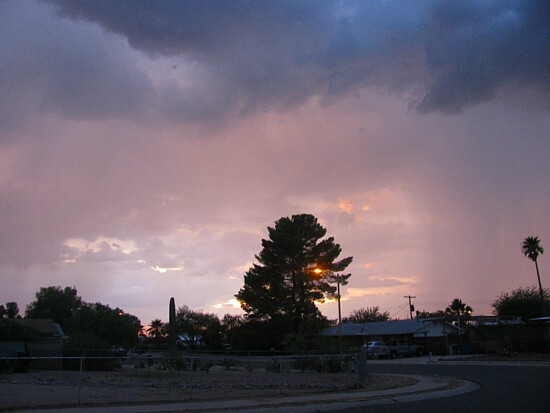 A typical sunset weather pattern - clouds building up and distant rain. A pattern of shadows from a tree near one of the park's few lights. Be sure to check Carly's blog Ellipsis every Monday for the Ellipsis Monday Photo Shoot! And if you like writing prompts, you can find John Scalzi's other old meme, the Weekend Assignment, right here at the Outpost every Friday. Be there! Aloha! Update: Carly asks about the shading /tint on the top two photos. I wish I could claim artistic credit, but basically I went with what was already there. Aside from my brightening the highlights and midtones, that's how the park photos came out of the camera. 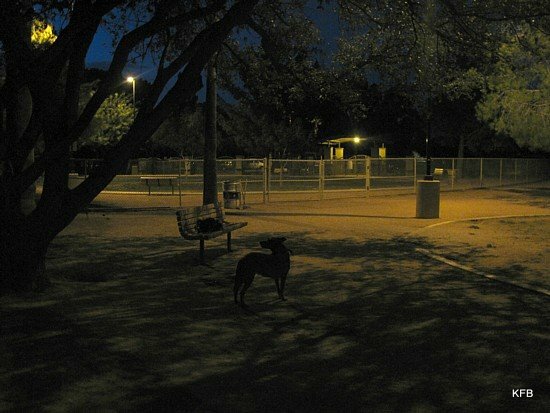 The park's lamps all cast a yellow light, which the camera picks up more strongly than the human eye. But even in person, the lights are noticeably yellow! I'm backed up on blog entry ideas again. Let's start with the most timely one. 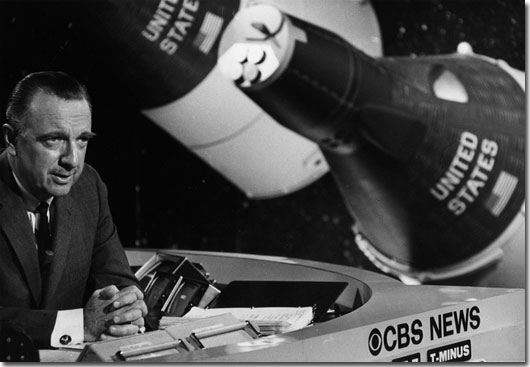 I mentioned in my Walter Cronkite entry that we watched mostly CBS during the Mercury, Gemini and Apollo space programs of the 1960s and early 1970s. I specifically remember watching a Gemini shot on tv at school in second grade, and watching Apollo 11 on tv at the summer house we used to rent on Lake Ontario, forty years ago today. Only two of the Syracuse tv stations were watchable on that tv, plus the only Watertown station. And of course I was glued to the tv as the crew of Apollo 13 struggled to get safely back to Earth. But my relationship with outer space hasn't been confined to television, fictional as well as the real thing. There was a book I read in first grade, possibly even kindergarten. It was called You Will Go to the Moon, and I've written about it before. I think one of the reasons I always found this second person, future tense story so objectionable is that I always knew it was a false promise. The story showed children, stand-ins for young readers, going to the moon with their parents, in a rocket that was already kind of outdated by 1963. I knew even then, at the age of six, that I wouldn't go to the moon. I did get to the Kennedy Space Center a number of times in the 1970s and 1980s, and the Johnson Space Center in Houston. Heck, I even lived in Cape Canaveral in the summer of 1976. But I never got to the moon. How many of you are old enough to remember The CBS Evening News with Walter Cronkite? When I was a kid, at least early on, the newscast on tv at our house was more often The Huntley-Brinkley Report on NBC. But we were watching CBS for the Apollo space program, and definitely during the 1968 Democratic Convention in Chicago. By the Watergate era, Walter Cronkite and the other mainstays of CBS News - Dan Rather, Roger Mudd, Charles Kuralt and so on - were part of my daily tv viewing. Walter Cronkite believed in gathering facts and getting them right as well as quickly, and reporting them objectively. It is largely because of their rarity that the few times he showed any hint of personal belief or emotion during his career as a reporter and news anchor are remembered now, on the occasion of his death. When he reported to the nation that President John F Kennedy was dead, after nearly an hour of bulletins and live coverage, he took his glasses off for a moment, and there was a brief, almost undetectable choke in his voice. 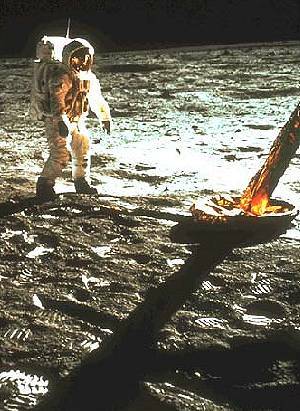 When Apollo 11 landed, he smiled, wiped his glasses and said, "Boy!" That was it. That was as far as he went in expressing his personal opinion during his tenure as the CBS news anchor. "To say that we are closer to victory today is to believe, in the face of the evidence, the optimists who have been wrong in the past. … But it is increasingly clear to this reporter that the only rational way out then will be to negotiate, not as victors, but as an honorable people who lived up to their pledge to defend democracy, and did the best they could." President Lyndon Baines Johnson reportedly reacted by saying, "That's it. If I've lost Cronkite, I've lost Middle America." Or words to that effect. The other time was when police were pushing around and roughing up people at the Democratic Convention, including reporter Dan Rather. "I think we have a bunch of thugs here, Dan," Cronkite said in disgust. But that's it. In all his years as a reporter and news anchor, from before D-Day to his forced retirement in 1981, that's the sum of the noticeable breaks in his objectivity: a second of suppressed emotion at a President's murder, noticeable but seldom overt enthusiasm for human beings landing on the moon, anger at the manhandling of his colleagues on the convention floor, and his one and only editorial in 19 years as anchor, predicting stalemate. For which, and for the occasional post-retirement expression of personal opinion, right wingers call the former "most trusted man in America" by that all-purpose epithet, "commie." Classy. Aside from all the moments mentioned above, and his nightly sign-off of "That's the way it is," followed by the date, I have two specific memories of Walter Cronkite, who has long been one of my heroes. The first of these was when Cronkite interviewed Egypt's president, Anwar Sadat, and asked him whether he would go to Israel and negotiate. Sadat said yes. Cronkite pressed him about when he would go, and he agreed to go the following week. If I recall correctly, he did much the same thing with Menachem Begin of Israel, who quickly agreed to meet with Sadat. I remember being amazed: Cronkite had just helped to jumpstart Middle East peace. And yet, all he was doing was asking a reporter's questions. The other time was when I was a freshman at Syracuse University, majoring in TV-radio. My Communications 101 course, held in a large lecture hall, had a number of interesting media guests, including the producer of the CBS Evening News, Douglas Kenney of National Lampoon, and, by phone, Walter Cronkite. I remember his saying (this may not have been during the phone interview, but in my course materials) that there was more actual news on the front page of a newspaper than in a half-hour news broadcast; and yet clearly he felt that both were important and valuable. TV news has changed forever since the days of Cronkite's nightly broadcasts. You can watch something that is at least labeled as news, any time of the day or night; but it may just be an old Michael Jackson interview, or people arguing about politics. On some cable news shows, objectivity isn't even attempted. I personally like a few shows hosted by certain unabashed liberals, the ones who make an effort to get the facts straight, and don't rudely interrupt their guests. Too much of the time, objectivity is replaced by theater disguised as "balance," with a designated Republican and a designated Democrat arguing about some current news item for five minutes. That's not news. It is, at best, infotainment. Frankly, I dislike hearing people shouting and interrupting each other, regardless of who they are and what they're ranting about. Still, the technology and democratization of news is pretty darn cool, and Cronkite himself appreciated this aspect of what has happened since 1981. Imagine what Uncle Walter could have done with easy, near-instantaneous satellite feeds from nearly anywhere in the world. It would not have taken an hour to learn the fate of a President, and images of the first moon landing would have been clear and in color, and not accidentally taped over by NASA. Cronkite didn't get to play with such toys very much, but he was active into his 90s. I remember hearing him on NPR as recently as last year, speaking intelligently and wisely about something or other. Goodbye, Mr. Cronkite. I miss you already. As always, Cayenne looks to me for comfort, food and entertainment. Pepper wags her tail at the mention of her name, but declines to come over to me. 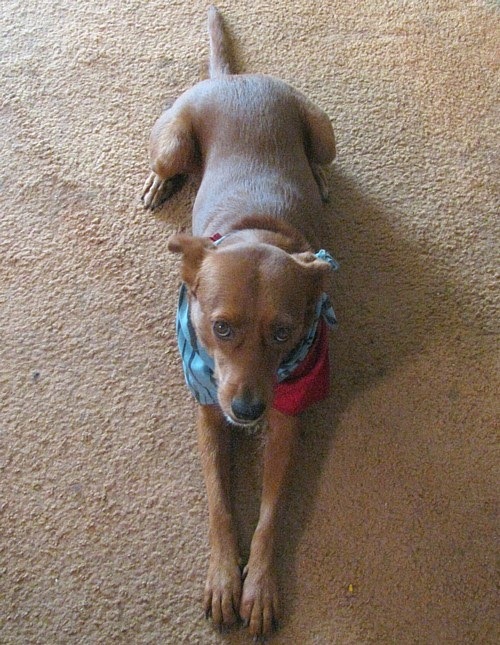 Cayenne shows off, hoping I'll pay more attention to her, and less to that other dog. Pepper grudgingly indicates her willingness to be petted. 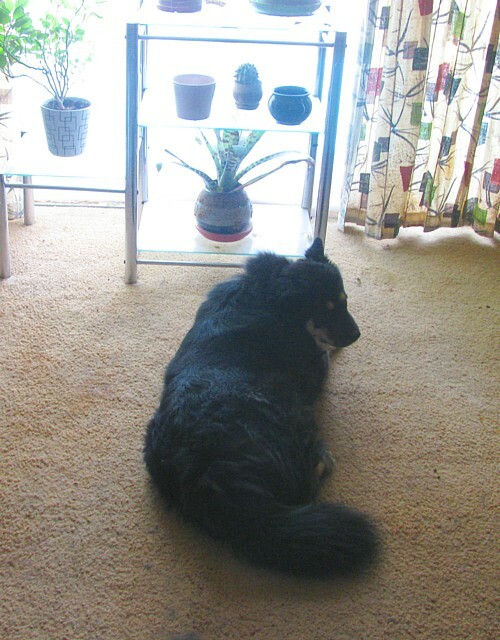 Mostly, though, she hangs out near the windows, watching the outside without subjecting herself to the heat of the day. 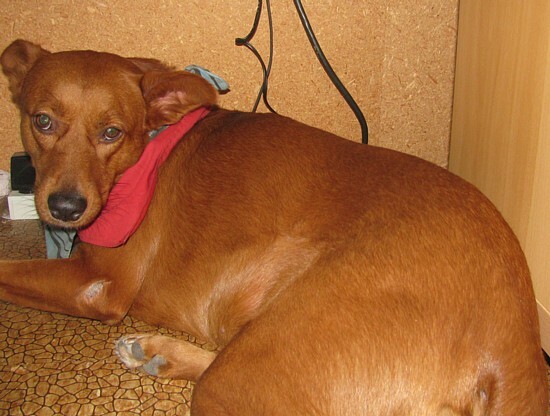 And when the thunderstorm arrives in the evening, Cayenne hides under my desk. Weekend Assignment: #276: Create an alias for yourself - not one you're already using or planning to use, but a temporary one for this assignment. Tell us the name you've chosen and why, and under what circumstances, real or imaginary, you'd ever use a fake name or identity. If you want to create an entire fake identity for your entry, so much the better! Extra Credit: Have you ever used a pseudonym anywhere other than online? It's funny, considering my tendency to plaster my real name all over everything I do; but I have used pseudonyms and aliases rather a lot over the years. When I was eight years old and the Adam West version of Batman was on tv, I tried to create a secret identity of my own, as Bat Friend. I created a costume (old tights made a pretty good cowl) and later led my two blindfolded friends to a secret lair, where they promptly crushed my fantasy by calling me Karen. Ah, well! In junior high I tried to cultivate the name Casey Jensen as a nickname and future pen name. As an adult I wrote a foreword to a book about the Beatles under the name Karen C King, or possibly K.C King, I forget which. And then there's my piratical alter ego, Black Rose Kate, who occasionally pops up in my blogs to comment on the modern world. But this is about creating a new alias. There are all sorts of online name generators to give users their stripper name, their hobbit name, thir vampire name, their Star Wars name, etc. There's even one that creates pseudo-Dickensian or Austinesque names. I don't really want to play at being Ida Pledgood, though, so let me try something else. Oh, I've got it! 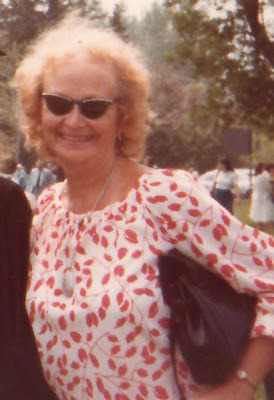 Luna M. Jones. 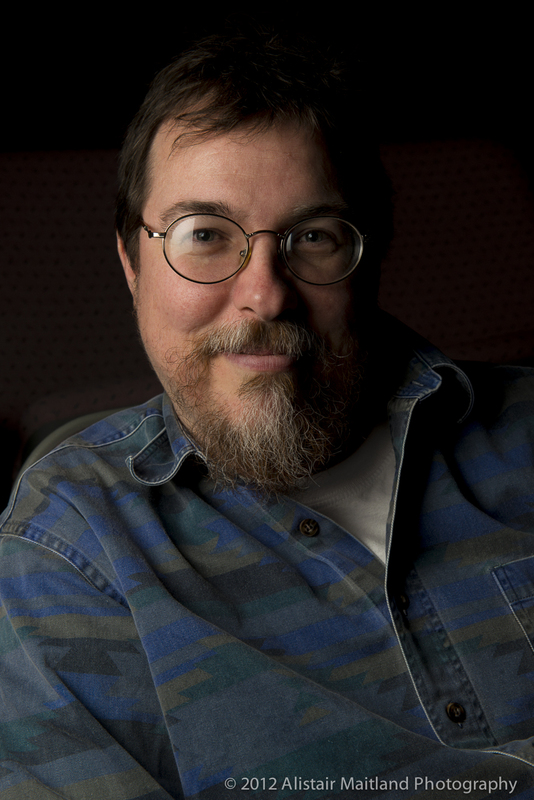 Born: May 10, 1948 in Ithaca, NY. The third daughter of two academics, I attended Cornell University, only to be expelled my senior year for participating in a sit-in in the assistant chancellor's office. Awkardly, the assistant chancellor was my dad. My boyfriend at the time, Doug, moved to Canada two weeks later to avoid the draft. I stayed behind, taking a job in an ice cream factory and writing political thrillers in between shifts. The most famous of these, The Ivy Proclamation, was on the New York Times bestseller list for 39 weeks. Unfortunately for my bank account, the movie version fell through when Keanu Reaves had a falling out with the director and left the project. I've been divorced twice and widowed once, but recently reconnected with Doug, the inventor of the telephone router, who receives the occasional death threat when people learn of his achievement. We're taking our relationship one day at a time. My daughter, Maxie Corrigan, manages a surf shop in Cape Canaveral. 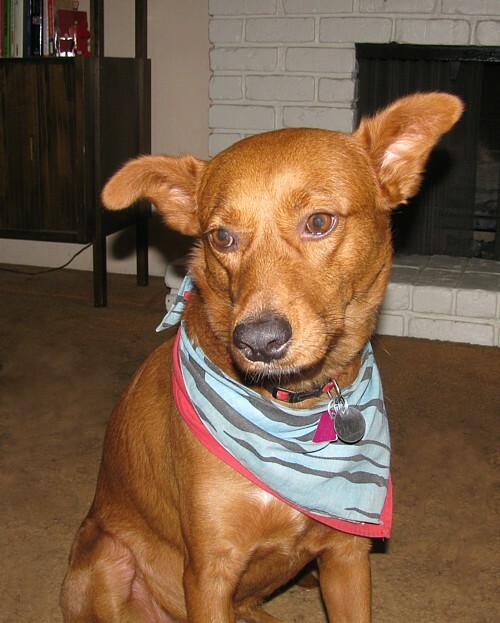 She's also the mother of three boys, Sam, Dave and Jack. Sam and Dave are identical twins. They'll be 14 years old next week, and Max has promised to take them hang gliding hang gliding on weekends. Sounds great to me; I earned my pilot's license While researching my third book, but I don't get to fly as often as I'd like. My sisters, Betel and Marte, teach astronomy and scuba diving, respectively, so we pretty much have all the elevations covered: sea, sky and space! Having created Luna (who is named for a Tucson street, by the way, not a Harry Potter character), what would I do with her? I suppose I would set her up with her own blog, or even attempt to write one of her books. But more likely I wouldn't use her as an alias, except to write first person fiction about her. On the occasional hot days we have had, we have spent in the ocean. The water was refreshing and actually warmer than the air. While at home at Moms, we must survive with an open window and an ancient fan. My mother doesn’t like air conditioning so we all suffer. We have two seasons: Hot (Summer) and Less Hot (Winter, ostensibly). Ski season for us is a snow flurry. Oh, we get a few cold nights - perhaps enough to freeze the early blooms on the fruit trees. Spring and Fall each last for about two weeks. The Southern California dream: the endless summer. Bright, comfortably warm days hanging out at the beach, cool and pleasant evenings, no need to make contingency plans in case of rain. It's reality - if you're lucky enough to live in the stretch of Southern California west of the mountains and east of the Pacific Ocean. In some places, that perfect-climate range is only a few miles wide, and even that's not always perfect.... I don't live in that special part of SoCal, though. There are a lot of people around here complaining about the lack of heat, but, I'm sorry, those people are just plain wrong. What is so wrong with it being warm enough to wear shorts, but not so warm that you can't go to the end of the driveway with out a water station set up there? That's it for now! As always, I'm looking for suggestions for future Weekend Assignments, and also for more of you to participate in writing the entries. Come on - as good the our three stalwarts above are, we'd love to hear from YOU as well. Thanks! Okay, that's an overly dramatic paraphrase, but that's how I've been feeling recently. Although I supposedly qualify for a new benefit year for unemployment benefits, they still aren't in place, and none of the avenues for (re)applying for them actually work. I've had no income since the end of May other than my small paychecks from St. Michael's. I had a supposed job interview yesterday, but it turned out to be a "cattle call" "reverse interview" to recruit commissioned insurance agents. Sorry, but I'd be terrible at that! And today I had a rather prickly conversation with a recruiter of people for medical industry. It turns out that billing coders need specialized knowledge that I don't have - which helps to explain why I've been unable to break in with any sort of accounting position. I just don't have the grounding in insurance codes and medical regulations. And it's hot. 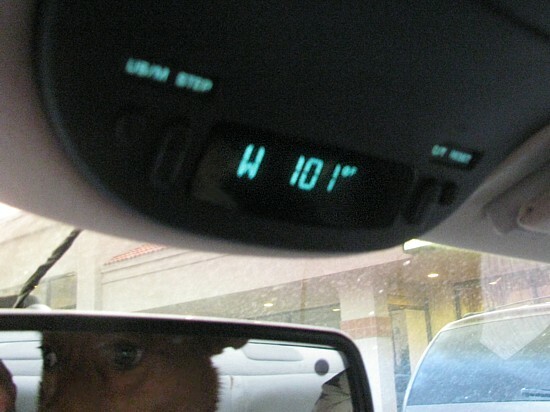 101 degrees, as seen on my car thermometer above, isn't a remarkable temperature for Tucson in July. Given all the recent days at 107 to 109, it seems a bit cool - until you realize that the photo was taken at 7:30 in the evening! The monsoon has started, so it's not "a dry heat." It's been relatively humid, and so far we haven't had much rain to cool things off. ...and I've wanted to photograph it for a while now. 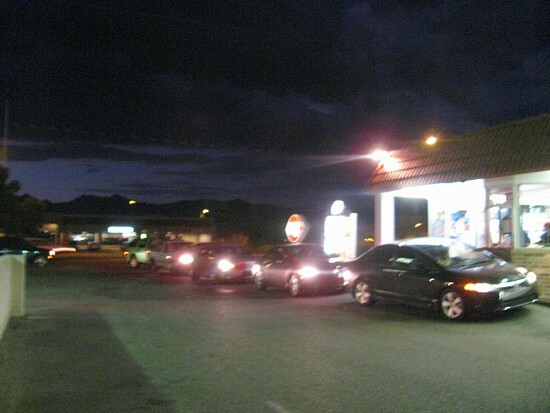 Every evening in this hundred degree weather, people line up to buy ice cream. It's mostly an evening thing, according to my observations. I'm guessing that most Tucsonans spend the day in their air conditioned offices and houses and stores, and emerge at night once it starts to cool off. 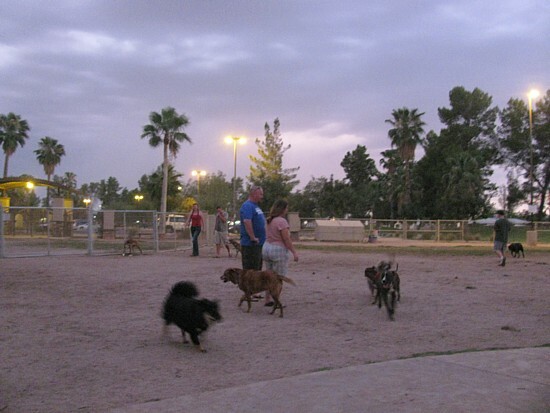 At the dog park, there definitely seem to be more and more dogs around at dusk. It makes sense; I've been worrying for a while now about taking Pepper out in 100 degree weather. After all, her breed is meant to be herding reindeer in the frozen north! I love ice cream. If carbs, calories, cash and crowds didn't argue so forcefully against the practice, I'd eat ice cream every day. 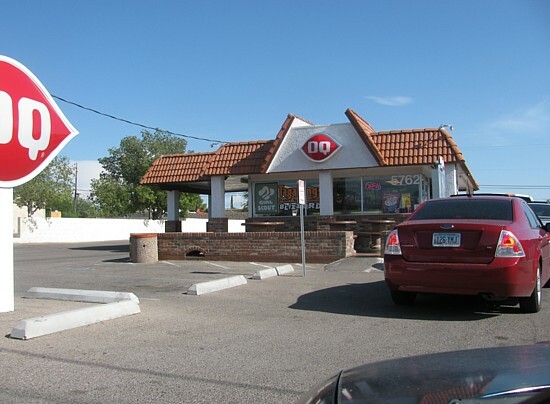 I'm especially fond of Dairy Queen's cherry sundaes and their chocolate-dipped cones. 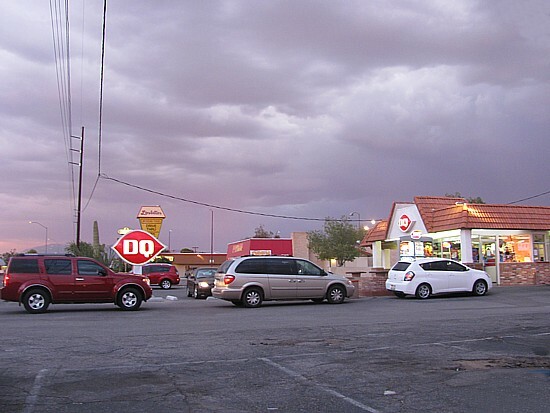 But every night, no matter how tempted I am, I see that line out to the edge of 22nd Street, and more cars making their way around the DQ building. That's when I say, "Not today!" and keep driving past. But once in a while, say on a Wednesday afternoon with no dogs in the car, I succumb. This week's Round Robin topic is "Silence," as suggested by Monica of Shutterly Happy. It's tricky to depict an auditory experience in a visual medium, let alone the lack of sound, and for a long time I had no clue how to handle it. My eventual solution was to photograph something that clearly produced sound in the past, but has now clearly been silenced. Here we go! 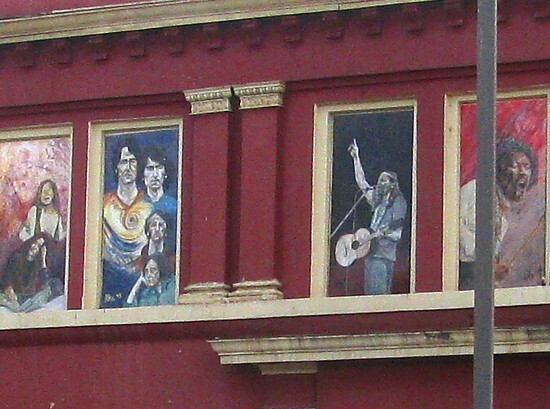 The pictures above decorate the former upper-story windows of the venerable Chicago Music Store (founded 1919) in downtown Tucson. I'm honestly not sure whether the guy with the guitar is supposed to depict Jerry Garcia or someone else (Willie Nelson? 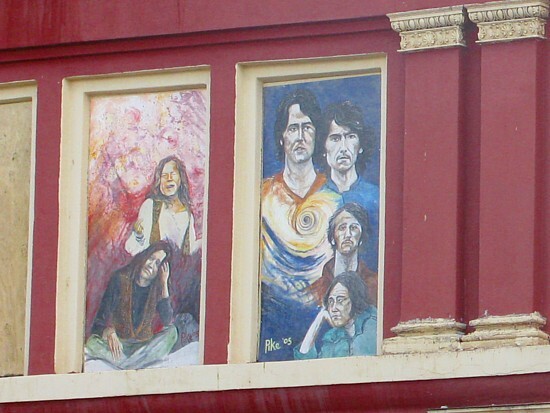 ), but the person in the next window over is Jimi Hendrix, whose music was silenced decades ago. Yes, we can still hear it, but not coming from him - and certainly not coming from that painted window! Same story with Janis Joplin at the other end. And although two of the Beatles are still alive, their collective voice as a group was silenced in 1970, breaking through again only briefly when Anthology came out. I've written a couple of times this week about a power failure we had on Tuesday, which drove me out of the silent house. On Friday evening the power went out again! 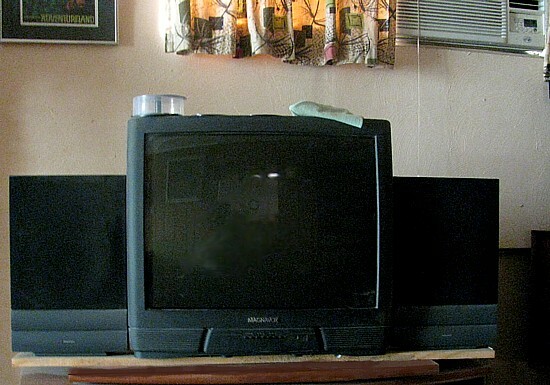 One second Rachel Maddow was coming on - the next, the tv screen went dark and silent, and so did the air conditioner above the tv to the right. This time the power was only off for a few minutes, but the noise of our electric appliances didn't exactly roar into life right away. 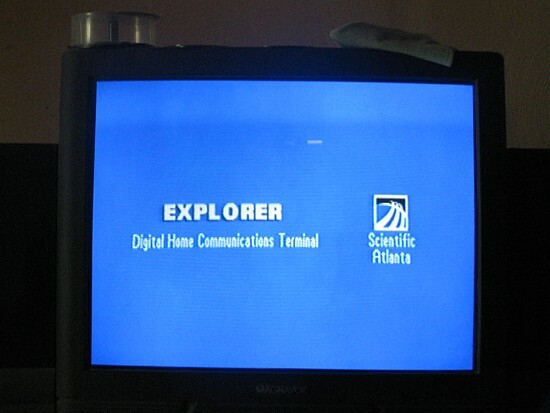 When I turned the tv back on, I had to turn on the cable box too. It promptly displayed this screen, silently, until I fiddled with it to try to get an actual station again. I may be able to come up with something more, later today, but that will have to do for now. Meanwhile, have a look at everyone else's silent photos! Kelly **Welcome, new member! ** - Posted! 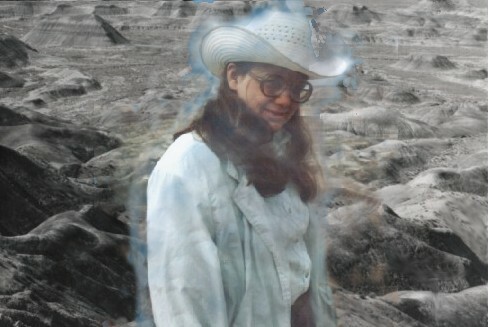 Linda (OC’s Mom) **Welcome New Member** Posted! 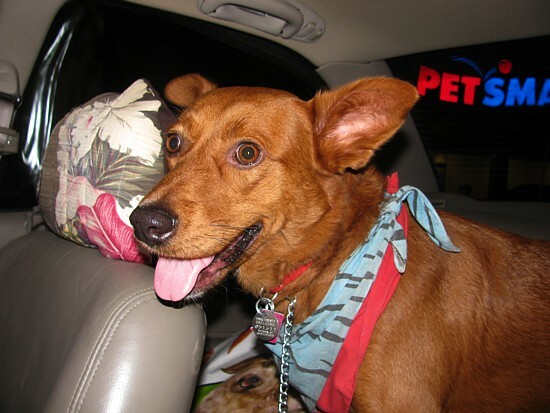 Annie **Welcome New Member** - Posted! Betty**Welcome New Member** - Posted! Ruth**Welcome New Member** - Posted! And please check out my other entries below if you get a chance. Thanks!